Kyle, Fatality and co. head toward the mysterious ship with a huge sun at its heart. They split into teams to investigate the planets which also make up the ship. Fatality and Munk discover the planet Okaara on which she and Starfire (now starring in Red Hood and the Outlaws) were trained. 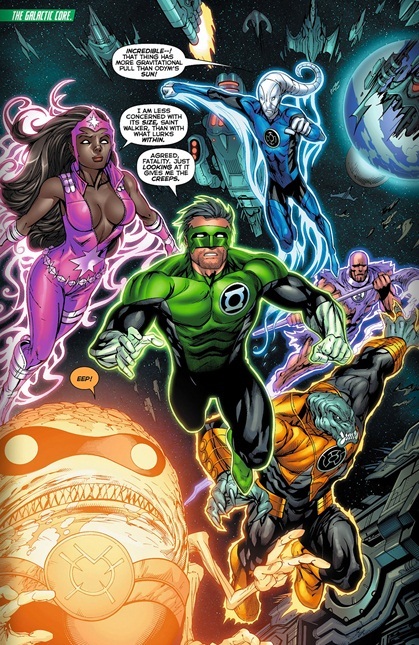 The blue and yellow lanterns discover the lost tamaranian race while Kyle and the orange lantern discover the legend of “the beast” Orange lantern leader Larfleez who’s the sworn enemy of their ship. They sound an alarm which rouses their guardian, the archangel who sleeps within their sun; Invictus. 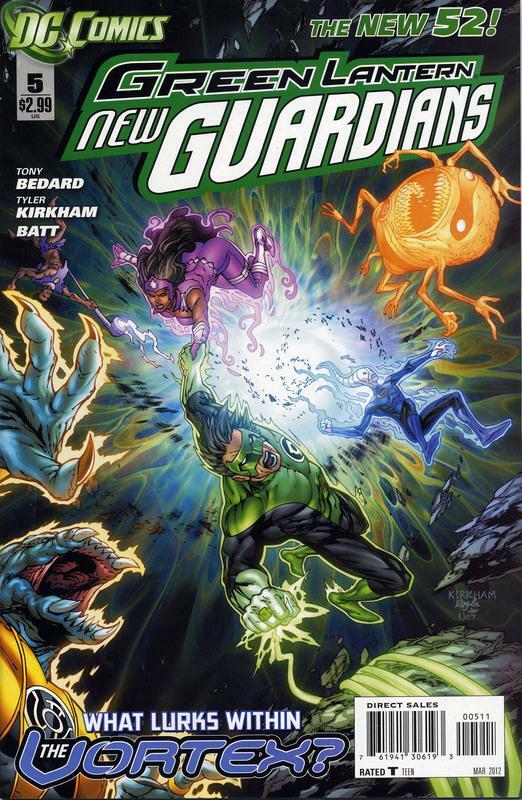 Cover-The New Guardians being sucked into a wormhole, all very visible though the indigo lantern lacks the glow of the other lanterns. All in all a good cover! Art- Tyler Kirkham wows me in every single issue! How can he keep up the pace? Books like Ultimate Spider-man and Batwing already are using fill in artists but this guy keeps hitting every page, panel and issue out the ball part consistently! I salute you Tyler you do great work! 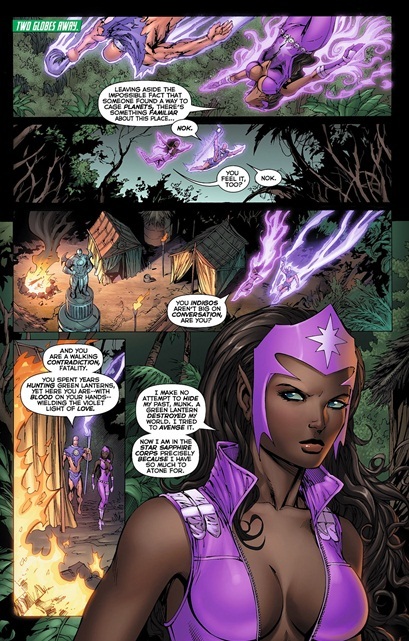 Characterization- Fatality’s past as a hunter of green lanterns and newcomer to the Sapphire corps of love are acknowledged and her powers of observation as a hunter also lead her to a few realizations about her indigo tribe compatriot, munk. It was also cool to see her rely on her combat skills as opposed to her ring, too often these ring wielders rely on the ring and nothing else. Mystery- This “ship” has me completely intrigued! Inside we find the thought deceased/extinct race of Tamaran and even the planet Okaara. What the **** is going on here? What’s even better is the thought of what other extinct races may yet linger in this ship? The Martians? The Kryptonians? Yes please on all accounts! Continuity- Red lantern Bleeze’s development in Red Lantern gets mentioned here as she regains her sanity here. We also get a nod to old continuity with Fatality acknowledged as learning her fighting style on Okaara. Same complaint as every other New 52 book past continuity and what is still cacon is all up in the air and not very clear!